Developed to refresh tired, lack-lustre locks between washes, Moroccanoil’s Dry Shampoo for Light Tones is ideal for post-workout, travelling or transforming your style before a night out. Fortified with ultra-fine starch, the lightweight spray instantly revives hair between washes to banish any signs of odour, product build-up or grease, whilst argan oil and subtle violet undertones balance brassiness in blonde hair. 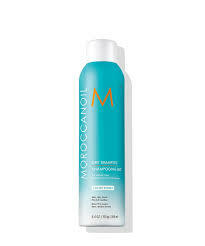 Buy MoroccanOil Dry Shampoo 205ml on-line today at Riah Hair.